Ahh...living history. I just can't seem to get enough of this time-travel hobby. During the first weekend in August I participated in a reenactment of a county fair in 1865 (as you may have read HERE) in which we had period games and contests and visited with President Lincoln. 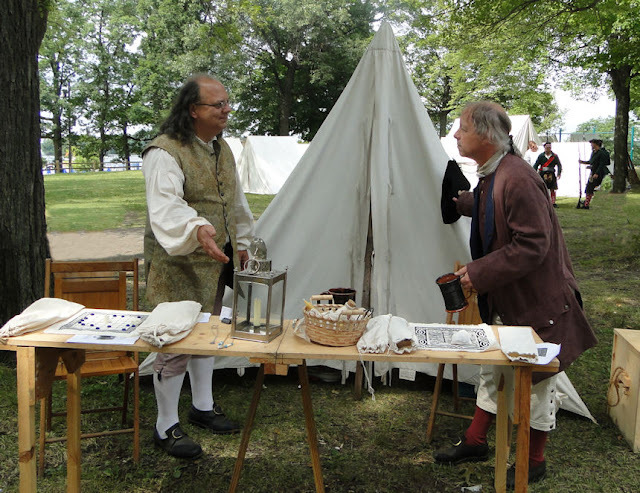 And now for the second weekend of August I found myself wearing clothing suitable to the 1770s and was able to watch the Patriots fight the Redcoats in the Revolutionary War as well as had the opportunity to visit with Benjamin Franklin. Talk about American History time-traveling experiences! 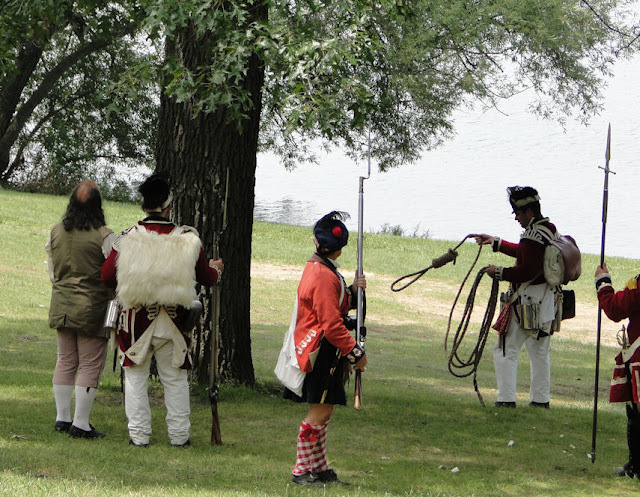 Though I have been reenacting the Civil War for over a dozen years, I'm only in my second year as a colonial reenactor, therefore this was my second time attending Colonial Kensington. And what a fine time I had! First off, I must say that there's a connection all reenactors have - even for folks who may not do the same time period, there is still a connection. Almost like an extended family. As living historians we all try to bring the past to the forefront, to allow the modern visitors to learn history in a way that goes beyond school books. And we all have our own ways of doing this, don't we? Some present, some immerse with 1st person, some do a combination of the two. But no matter how one reenacts, our ultimate goal is the same - to teach. I have no problem doing this for Civil War due to the many experiences I've had while spending time in the 1860s, and now I am learning to do this in the 1770s as well. Yes, there are some differences. But anyone that knows me knows my style of living history - I like to immerse myself into the time I portray, to feel as if I am really "there." It's in this way that I can draw the visitor into my world of the past, hoping that when they leave they will have felt as if they actually spoke to someone from another time. I very much enjoy watching other reenactors from both eras do this, for seeing the many differing styles is a great learning experience for the newbie and the more seasoned. One of the things about doing time-travel excursions to more than one era is that I have been able to extend my personal research challenges, allowing for an entire new/old world to open up, gaining even more knowledge and insight into the world of long ago. I've studied this period my entire life (over four decades), but to bring it to life has new and exciting challenges, of which I happily accept. At this year's Colonial Kensington I felt myself personally growing in confidence in presenting the era. I've spent a year "getting my feet wet," and now I'm wading in deeper waters. It's not that I don't know about the colonial era - that has always been my favorite time in American history and, as I mentioned, have studied for well over 40 years - it's just finding my way in this time period in the manner that I present. Colonial Kensington is a wonderful event and considered one of the largest RevWar/Colonial reenactments in southern lower Michigan. It's held in beautiful Kensington Metro-Park out in Milford, and the surroundings of water and trees add to the note of authenticity. Visitors come by on foot or on bike, and sometimes even by way of canoe. 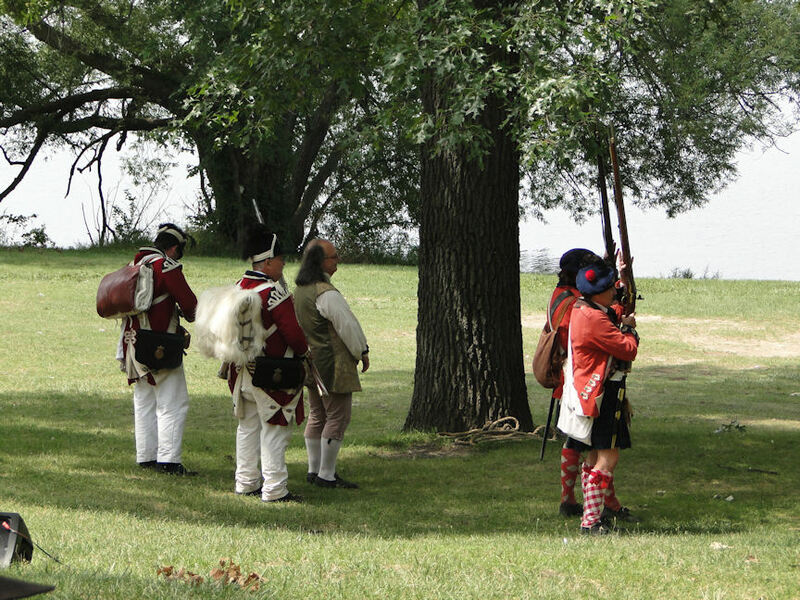 There is a mix of French & Indian War and Revolutionary War reenactors, as well as a few who portray the local Michigan Indian tribes. 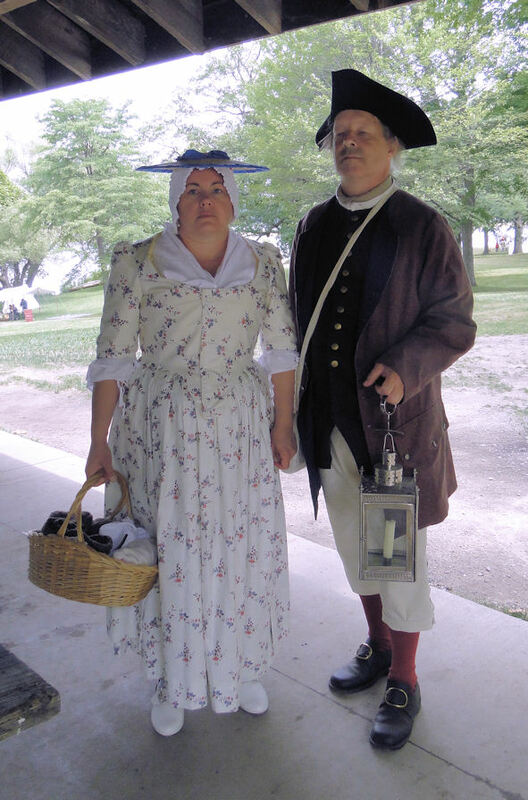 But even though it's based in Michigan, there is room for some of the more eastern period populace, such as Benjamin Franklin, to make appearances (my style is 1770s eastern/Boston as well, with hopes of morphing into Paul Revere). As you shall see in the following photographs, Colonial Kensington is one very fine event, and my hat is off to the good people, such as Dave Marquis (see photo above right), that put this on. I am honored to play a part. I first met the gentleman who portrays Dr. Benjamin Franklin at the 2014 Colonial Kensington event, and from the moment I greeted him - improperly, I might add – I knew that this was a man I could learn from. Not only because he was the great Benjamin Franklin, but he reenacted much in the same way as I strive. You see, in my inaccurate greeting I extended my hand for a handshake but was politely informed that “this is an unusual custom, the grasping of hands,” and then the good Doctor proceeded to teach me the proper etiquette for greetings of the time: a slight bow and an extension of the right arm, as you see in the photo here, and maybe even a spoken acknowledgement similar to which I wrote above. Anyone that knows me knows I do my best to be as accurate as I can, and this fellow had given me a fine start. Recently I purchased a book called, "Eighteenth Century English as a Second Language - A Workbook and Series of Instructional CDs" by Cathleene Hellier, who is described as being a historian with the Colonial Williamsburg Foundation's Department of Training and Historical Research. The back of the book also tells us that this series of lessons has been designed to help historical interpreters and reenactors better understand the language of the period and sound more like the persons they portray. Lessons contain grammar, vocabulary, and conversational etiquette for all levels of society. Please allow me to be un-colonial for a moment and say "How cool is this?" Yes, I am very excited about learning some of the vocabulary style of the colonial period and plan to incorporate it into my presentations. It will be a slow process initially, and I will need to keep modern speech heavily flavored as to not turn any modern visitor off, but I believe the overall presentation should prove to be successful. At least I hope it will be. Either way, I have interspersed some of the eighteenth century jargon into a few of the photographic captions here and there in this posting. By the way, if you are interested in purchasing this book for yourself (or as a gift), it is only available through the Colonial Williamsburg Store - click HERE for the link to the store where it should be available. So, anyhow, why don't I show you all just how wonderful an event Colonial Kensington is by way of the many photographs I took while there. Yes, just as I do at Civil War reenactments, I remove my camera from my haversack, snap a picture or two, then quickly put it back. If at all possible, I do not want to ruin visitor's impressions, you know. Here we have Richard Heinicke the Blacksmith. What he sells, he makes. What he makes, he sells. I've heard many old stories of villagers who would stand around the smithy as he did his trade, the smell of the fire and the singeing horses hooves pervading throughout while the sound of the hammer on the anvil could be heard all around. Besides shoeing horses, a blacksmith made or repaired numerous hand tools and agricultural equipment: hoes, pitch forks, harrows, plow shares, shepherd’s crooks, gate hinges, railings, the ironwork on wagons, nails…and, of course, the necessities for cookware including pots, kettles, kettle holders, spatulas, pokers, lifters, and anything else you can think of. Now, I'm not sure if Mr. Heinicke made this particular tripod for open fire or hearth, but I suspect he did, considering he is considered to be one of the best blacksmiths in the area by many and attends numerous reenctments in both the Colonial and Civil War eras. 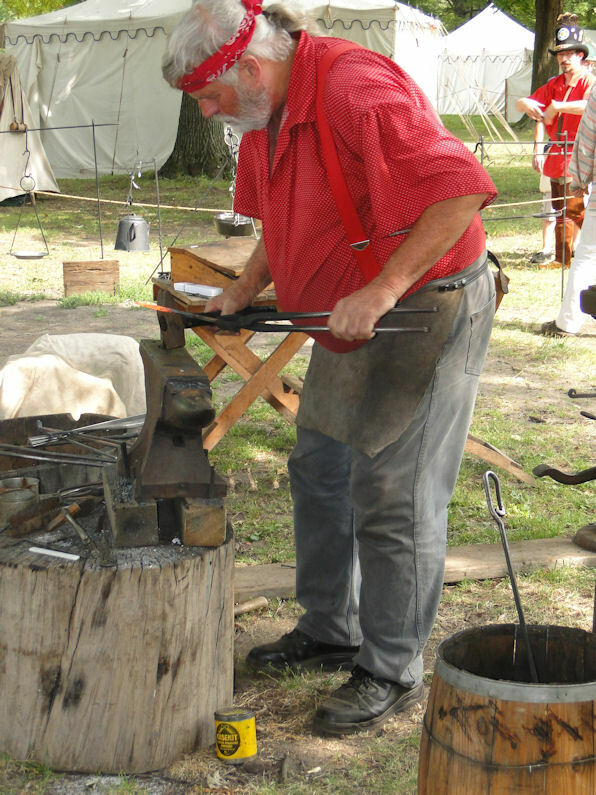 Here we have a gentleman working on a pewter spoon. 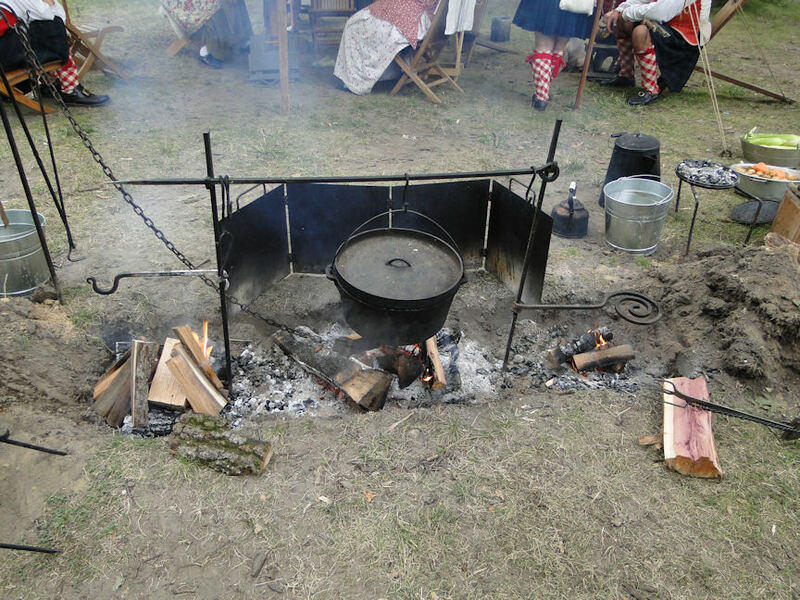 Pewter, along with wood, was among the most popular for making eating utensils. Make sure you take care not to get hurt. This is one guy you don't want to have to go see! 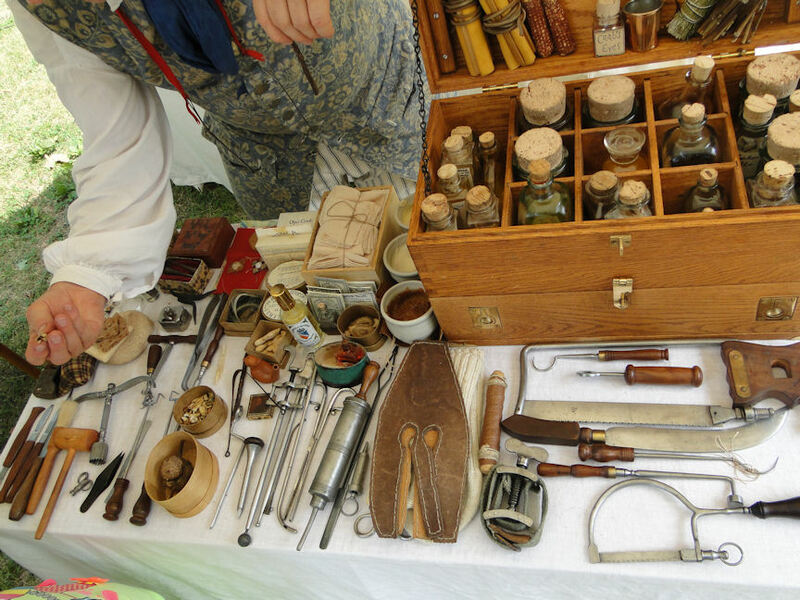 Just the every day tools in the 18th century medical field. Yikes!! As we moved about the village, we met many fine people wandering hither and thither, some with a purpose, others on a stroll. "How do you do? How does your family all at home? And how does your father, old fellow?" compliment you on your fashion." Here is my good wife and I. My circumstances for this year past have been fine enough, though the news of late has much alarmed us. I could not but take notice of the current situation at hand, what with the uprising of the Patriots against the Crown. We had travelled in hopes of removing ourselves from the troubles but found ourselves in the thick of it in what we thought of as being a peaceable little hamlet known as Kensington. But, nay, we, instead, feared for our very lives. Before travelling here, we saw but little of the War. However, it has taken over - I have witnessed this with my own eyes - and is expected to escalate. How it can have got about, God knows, but everybody speaks of it as certain. I shall like to oblige you, friend, and would be so good as to inform you of the truth in these matters as I have seen and to ask for your assistance on how I had best proceed. First Foot Guards Grenadier Company (with companions). Off to squelch the rebellion. Well, they certainly will try, but I'm not sure if they'll be able to do it. The Americans are pretty steadfast and don't back down easily once you get them riled up! See the guy to the right? Yeah, the one dressed differently...he's my son Robert, and though he's been fighting the American Civil War for over a decade, this was his first venture marching, drilling, then fighting as a Revolutionary War soldier. He loved it! Here we have Dr. Benjamin Franklin, one of the finest of all of our Patriots. The man who portrays him really does the "original" proud. He and I have had conversations about this (arguably) most popular of the Founding Fathers, and he answers my questions fully and completely to where a full understanding of his thought process allows you to feel as if you were in the original's presence. Who knows? Maybe I was! Dr. Franklin didn't give a speech on any one subject; he, instead, did a Q & A with the public, allowing the audience to ask him questions and he, of course, providing the answers. and began claims of sedition and treason. In 1772 Benjamin Franklin, who was in England at the time, anonymously received a packet of thirteen letters. They were reports by Thomas Hutchinson, the lieutenant governor of the Province of Massachusetts Bay, to Thomas Whately, a leading member of the British government. In the letters, Hutchinson made some damning comments about colonial rights. Hutchinson recommended that popular government be taken away from the colonists “by degrees,” and that there should be “abridgement of what are called English liberties.” He argued that all colonial government posts should be made independent of the provincial assemblies. Finally, he urged his superiors to send more troops to Boston to keep American rebels under control. Understanding the inflammatory nature of these letters, Franklin circulated them to his American friends and colleagues but on the condition that they not be published. Clearly in the public interest, at least from the point-of-view of American revolutionaries, the letters were published in the Boston Gazette in June of 1773 in defiance of Franklin’s request. As you can imagine, the patriotic citizens of Boston were furious, and in May 1774 Hutchinson fled the colony back to England before he could be tarred and feathered. However, he refused to say who gave him the letters. man about town being confronted by the King’s Army. On January 29, 1774, Franklin was hauled up before the Privy Council to explain why he had leaked letters in the ‘Hutchinson Affair.’ He was accused of thievery and dishonor, called the “prime mover” of Boston’s insurgents and charged with being a “true incendiary.” Throughout the hearing, Franklin maintained a dignified silence. For his disloyalty to the Crown, the Privy Council held off sending Franklin the gallows or even sentencing him to an afternoon in the stocks. Instead, Solicitor General Alexander Wedderburn was satisfied with the tongue-lashing he meted out to Franklin and the next day the Board of Trade dismissed Franklin from his post as Deputy Postmaster General of the North America colonies. 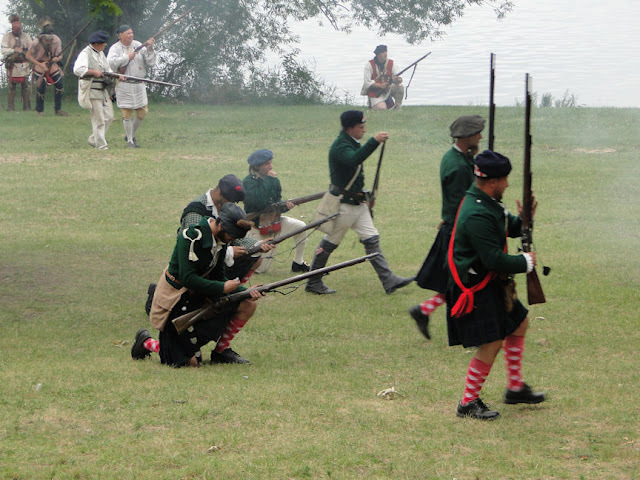 Of course, what would a reenactment of the RevWar era be without a battle? 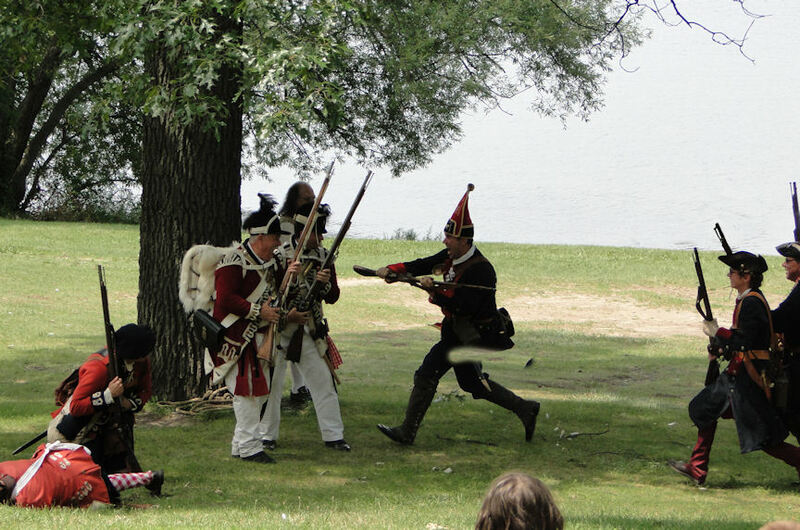 And it was a fine battle at that, giving the patrons a fair idea of the types of maneuvers and tactics used and uniforms warn by the military on both sides of the pond. The American Patriots arrived on the green. The Red-coated Regulars did not respond in kind. But then neither did the Americans, who charged the King's Army. As the skirmish commenced, the crowd was thrilled to see a reenactment of a Revolutionary War battle occur before their eyes. The local Indians also got involved. I found it amusing that my son, a descendant of a Revolutionary War soldier, was in the Queen's Rangers Highland Company on this day. It was great fun for him, for this was his first RevWar battle ever. Here is a short video clip I took of the battle. It centers on the Queen's rangers for that's where my son was. American Military Camp: As a kid, I was never very interested in the military side of our nation's history. As an adult, however, I have a full appreciation, respect, and, most important, a greater understanding of the importance of knowing our military history of all wars, but especially during the founding period. Even more so now with my wife being a descendant of a RevWar Patriot! And now for some post-battle entertainment. I'm only sorry I did not video these two - they were great! Hearing the period sounds of the fife & drum is akin to having a film soundtrack. It just seems to complete the picture. Can you not just hear "Road to Boston," "Yankee Doodle," and other popular tunes of the day?. My wife took time to go shopping at the traders/sutlers shops. At first glance, you may not be quite sure of why I included this picture. Are they visitors who wanted to have their picture taken with people from the past? Well, as often as that does happen, this isn't one of those times. Regular readers of this blog may or may not recognize these modern folk as members of the 21st Michigan Civil War unit I also belong to, for their clothing is quite different here. Yes! A few from the 1860s/21st century came out to see Patty and I...oh, and to see the reenactment, too! It was so neat! I also had each pose with Benjamin Franklin. This topped the day for me. And there you have it, our time-travel excursion to the era of our Nation's founding at Colonial Kensington. I had one terrific time, I must say. Other reenactors who happen to be my Facebook friends tell me how surprised they are about how often I participate in events. I reply with, "I live in the past. I reenact the 21st century." I was once told to watch myself or I may suffer from reenactor burn-out. But here I am, a dozen years-plus later, and nothing of the sort has overcome me. In fact, it's been just the opposite - it's on the weekends when there isn't a reenactment that I find myself going a little stir-crazy! Yeah...I am a bit on the crazy side. "I am ready to give any assurance that nobody is better disposed to your interest and service than I am, Dr. Franklin, or that wishes you more prosperous and happy in your government. I wish you a good day." How fitting that I read your blog today....I recently watched the HBO mini-series John Adams and I made the comment to my husband just today that listening to 18th century English was at times like trying to decipher a foreign language! Funny timing! I'll definitely have to look into purchasing that workbook and cds. Thanks for sharing!